Born Lucern, 1952; saxophones, composer. Urs Leimgruber has been active for many years in the areas of contemporary improvisation, composition, jazz and new music. 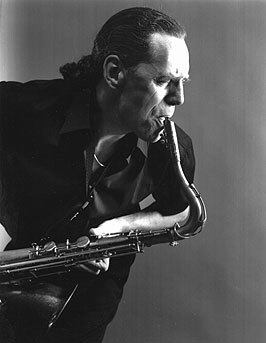 One of his earliest associations was as a member of the electric jazz/free music group 'Om' with Christy Doran, Fredy Study and Bobbi Burri, and he later formed the 'Reflexionen' quartet with Bobby Burri in New York. More recently, his own projects have included 'Ensemble Bleu'; the 'LSM' trio with Patrick Scheyder and François Moutin; as well as a long association with Fritz Hauser: as a duo with the ongoing Music for saxophone and percussion; in the Leimgruber/Roidinger/Hauser trio; a trio with Jöelle Léandre; and a trio with Marilyn Crispell. Urs Leimgruber has also performed extensively as a solo artist and has been involved in mixed media presentations, providing music for dance, radio plays and film. Urs Leimgruber has undertaken concert tours in Western and Eastern Europe, USA, Canada and South America, and appeared at concerts and on recordings with such musicians as Steve Lacy, Tim Berne, Joe McPhee, Christy Doran, Francoise Kubler, Louis Sclavis, Hans Koch, Bobby Burri, Pauline Oliveros, Ives Robert, Daunik Lazro, Harry Sparnaay, Jacques Demierre, Don Friedman, Herb Robertson, Trilok Gurtu, and Steve Argüelles. He has been involved in performances of compositions by Walter Fähndrich, Edu Haubensak, Mani Planzer, Maria de Alvear. Though born in Lucern, Urs Leimgruber has been living in Paris since 1988. Solar plexus,	Indian 1002. with Bobby Burri. 1985,	Mountain hymn, L + R 45002. Duo with John Wolf Brennan. 1986,	An chara, L + R 45007. Duo with John Wolf Brennan. 1988/1989,	MAP (Music for another planet, L + R 45021. With John Wolf Brennan and Norma Winston. 1989,	Polyphyllum, L + R 45013. Duo with John Wolf Brennan.